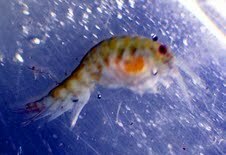 Glen R: Attached are some plankton and shrimp pics that I took 12-2-10, 8:30 pm at the dock float, yesterday, Thursday night. It was a minus tide. 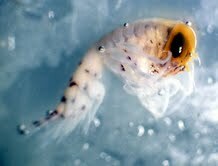 When I shone my light in the water, I saw Coonstrip Shrimps with 2 bright headlights on. There were dozens of them December 1st. First you see is two wandering headlights in apparently clear water. 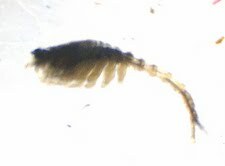 But then they climb on each other or hang out on eelgrass scraps or dock pilings. I was mesmerized by how they seemed to be able to move in any direction. I couldn’t get a photo of them doing this. 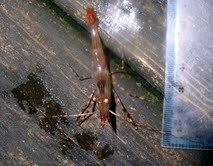 I caught one, easy to do, and took a flash photo on the dock. There were many more on December 1st than on the 2nd. I also noticed a surprisingly large concentration of plankton. to catch them for late microscope photos, I walked up and down with my homemade plankton net thing, which I made with a coffee can, rope, thrift store women’s stockings, rope, cord and a glue gun. 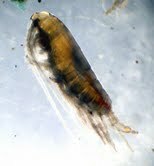 I got quite a few plankton captures by simply dipping a netted container in the water. 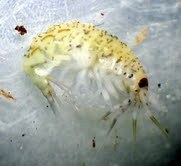 There were dozens of copepods in every square meter of water surface. Julie: Frosty all day. Wild birds collecting in the bare trees, staring at the chicken scratch and flitting down to feed occasionally. Woodpeckers and thrushes feed on the mushy apples in the trees. Those bugs have been attracting gulls in usual and accustomed spots such as Cowlitz. The sea doen't seem to shut down just because it's Winter.